After almost 4 weeks of competing on which blog has the most number of Likes in the Best Cebu Blogs Facebook fan page, BCB 2010 is now announcing the bloggers who made it to the top 20. Below are the top 20 finalists in alphabetical order. The top 20 bloggers are automatically invited to the very first offline awarding event on December 12, 2010, 4 PM to 8PM at Sugbutel's Penthouse. 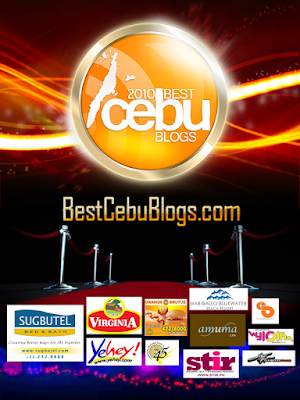 Best Cebu Blogs 2010 Awards aims to recognize the existence and relevance of blogging in Cebu’s local online scene. It also aspires to augment Cebu bloggers’ influence in the general cyber community worldwide. The official nominees presented on Best Cebu Blogs Facebook fan page which are competing for the most number of Likes are initially screened based from BCB’s main criteria of judging. The top 20 Nominees are then determined according to the number of Likes in Facebook to distinguish the number of followers of each blog and to measure the persuasive ability of each blogger. High number of Likes is equal to high number of followers which means the blog has wider influence. The Best Cebu Blogs 2010’s 20 finalists are then screened by three judges according to Content (Relevance to Cebu, Grammar & Sentence Construction) and Design & Layout (Appeal and User-Friendliness). On the awarding night, only the top 10 blogs will be announced as the Best Cebu Blogs for the year 2010. Thanks Novell for the visit and Good luck to all! nyahaha. thanks pinay scribbles -my sister..